All dries and nymphs offered in my shop have proven their efficiency over and over for quite a while on many waters. All nymphs with golden or tungsten bead heads are exclusively tied by myself. They are meant to help you catch more and larger fish. The dries are brought from a first-class tier, and I repeatedly test their performance myself. All patterns are made from first-class components and you will find them any time in my personal fly boxes. Of course it is more expensive to use only premium quality materials, but tying on a Norvise saves time. This way it is possible to offer top quality patterns at a moderate price. Frequently customers ask if these patterns are not tied in tying factories somewhere in Africa, which is supposed to be a lot cheaper and would also permit a higher sales markup. The answer is simple: I don´t want to sell you cheap stuff!! There are different examples, too, though. A good friend from Canada is running a so-called tying farm in Thailand. All the patterns I have seen from this source so far are absolutely impeccable. However, the prices given don´t seem to permit marketing them over here. My nymph patterns have evolved over time by constantly experimenting, and new ones have been added. My experiences fishing them in Canada have also contributed. In the end patterns are subject to constant evolution - all of them, not just mine. Tying materials are replaced by others, be it to improve their attractiveness or their durability, or just to improve visibility for the angler. 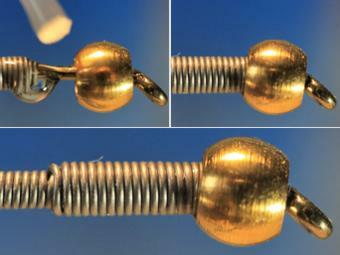 All these factors make fly tying so incredibly thrilling. The final verdict is always dealt by the fish! Another factor as to flies, nymphs, streamers or other imitations - believe it or not - is your own attitude towards the pattern you tie on your tippet! Even a slight lack of confidence whether this is going to work or not will noticeably reduce your success. If you have no confidence in the fly you´re fishing you´re just wasting time. This is not due to the fly, but to the negative influence of our attitude on our handling of our equipment. Why should you concentrate on your fishing if you don´t have the right fly? The result will turn out measurably inferior! Exsample: Nymphs, some of the features we offer you with our custom fly tying. 1. All steelhead nymphs come with the barb smashed. 2. Our custom made brass beads, available in gold- and silver- plated, are perfectly tapered and counter-sunk to harbor two layers of lead wire. 3.Two layers of lead, a longer and a shorter one, result in a base for a naturally tapered body. 4. The two layers fit exactly in the rear hole of the bead. 5. Before we push the lead into the bead, we add a little cyanoacrylate. 6. 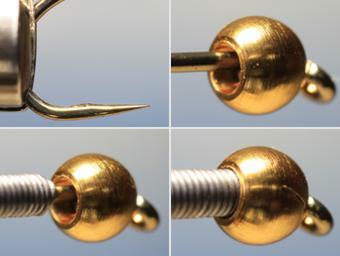 The hook, lead and bead form one solid unit. 7. The tapered underbody, ready to apply dubbing on. As long as I can and as long as I have the time, I will continue tying my best patterns for you. Of course, I would appreciate any feedback from you on your experiences with my patterns. Nymphs for Trout, Grayling etc.